After a few weeks of working with Word 2008, it’s apparent that there is a major convergence between how Apple and Microsoft think a word processing application should work. While Word hasn’t changed much when it comes to creating text-based documents, it has changed significantly when to comes to creating documents that are more page layout than word processing. In my initial testing of the latest version of Microsoft’s word-processing app, I’ve found Word 2008 to be an excellent revision to what was already a very good program. 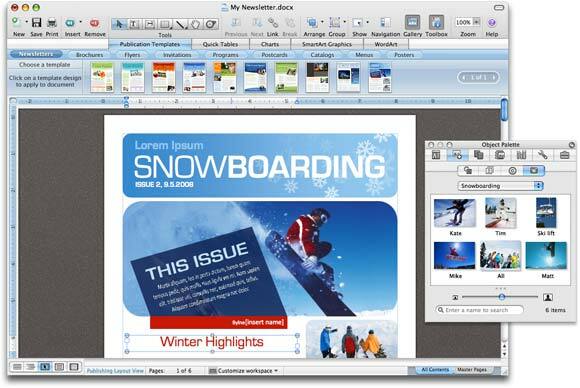 Word 2008 sports a major interface overhaul that is more streamlined than any previous version of the program and which gives you a single, customizable toolbar for accessing oft-used commands and one-click access to many of Word’s key tools, such as a table of contents or articles you’re citing in your document. Word also includes dozens of professionally designed templates for letters, newsletters, cards, posters and much more. In the past, customizing Word to suit your individual needs was very complicated—possibly too complicated for the average user. This was largely because the options you needed to change were often buried several tabs deep in Word’s preferences window. Microsoft has significantly eased this process by changing Word’s preferences interface to resemble OS X’s System Preferences panel. As a result, for the most part, you’ll find that it is much easier to find and change Word’s preferences to suit your needs. The same is true for Office’s newly named “toolbox,” the floating palette which makes it easy to access most of Word’s document formatting, research, and citation management tools. Clicking the arrow in the upper right-hand corner of the palette flips it over in a Dashboard Widget-like fashion, allowing you to easily adjust the palette’s appearance and available features. The most significant change to Word comes with the addition of a new Publishing Layout View. The new view allows you to create complex page layouts, similar to what you might do With Adobe InDesign, Quark’s QuarkXPress, or Apple’s Pages. It’s here that both Word and Pages bear a striking similarity to each other. 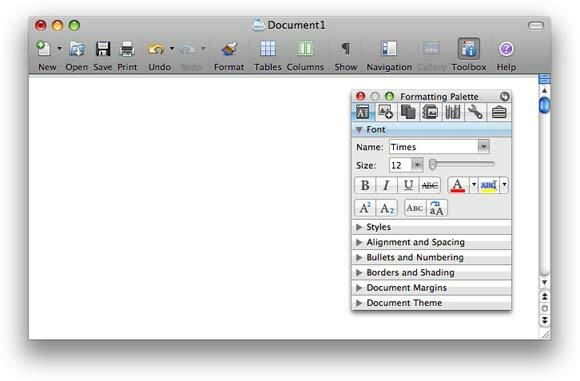 As with Pages’ two distinct work modes, Word also has two completely different ways of working with documents. Word processing documents are text-centric and should be used for things like reports, letters, thesis, and other documents that include more text than graphics. Microsoft says it created the new publishing layout view because users had trouble creating brochures, flyers, and programs with Word. Like any good page layout program, Word’s Publishing Layout View allows you to arrange text and graphics on the page in any way you choose, linking overflow text on one page to a text box on another page. The addition of this feature gives Word for the Mac more parity with Word/Publisher in the Windows world. That’s what I’ve learned so far in my work with Word. What remains to be seen is how easily you can automate Word now that Visual Basic for Applications is no longer included with the word processor. It appears that there’s a reasonably large AppleScript library to work with, and about 30 Automator actions that can be use to manipulate Word. I’ll have more on those features, plus a final assessment of Word 2008, in my review, appearing after Office 2008 ships.